I just installed Win-8 on my machine. Bryce had been running reliably on my Win-7 installation but now its impossible to position rotate, scale and/or rotate an object. When I try to perform a rotation the object spins wildly, Scaling and positioning are also wildly accelerated! I tried a new installation with exactly the same result. The graphics card is a Radeon HD-5450. Any suggestions. Look at vid card s/w driver settings; sometimes there is an ability to slow down the speed capability. I have never done so but it has worked for others on other 3D programs. The Radeon drivers used by W8 may not be quite right at the moment.. maybe download the latest from their website and try again. I'd have to second the thought above that it's faulty Radeon drivers. I remember in the past other AMD GPU drivers (ATI back then) weren't quite right for one of the windows releases, XP perhaps? And it took a while for them to get it sorted out and get a better driver out there. Maybe better not to get Windows 8 until the bugz are out. For windows its always better to wait a while before getting the new version. Personally Windows 8 is so not ever going to get installed on any computer I own. Same here. I'm really not happy with the direction they've taken windows 8. I dont even own a smart phone because I hate all those stupid little applications, now windows wants me to turn my desktop into a giant smart phone. NOT for me. you can get rid of the recycling bins, change desktop icons and uncheck recycling bin. if you gave win 8 a chance I bet you would like it. it takes about 5 minutes to "get it" then you'll like it. Its almost like moving from windows 3.1 to 95. No sorry I know I would hate it. That is just me. I don't like Win 7, Every version of windows that comes out takes more control away from the user, more nanny mode things installed. I like to have control, I run the computer, the computer does not run me. Windows 8 - is that yet another smart phone? No thanks! I'm not going to bang with the fist on the screen. It never helped. More serious: the only Windows I've ever installed before a service pack was out was 7 and I regretted it. Now, SP1 is installed and 7 looks usable. Changed from Win 3.1 to 98SE, to 2000 SP3 (now 4), XP SP2 (now 3) and always had a workable opsystem. But I'm not repeating the stupidity I did with 7. Thanks Horo. 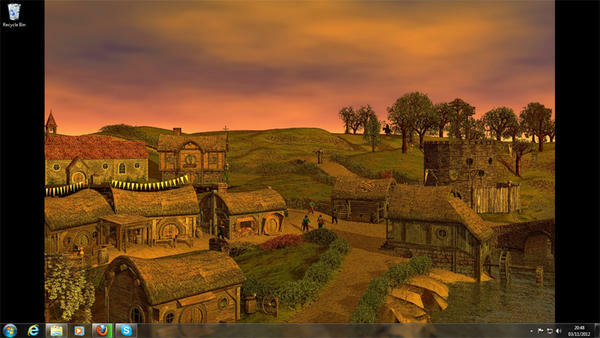 I won the halfling village in a contest, when it first came out, and that was a render I did for them to say thanks. My backdrop changes, depending what I am working on. I find it is a good way to work out if the image is working out. Same here. I'm really not happy with the direction they've taken windows 8. I dont even own a smart phone because I hate all those stupid little applications, now windows wants me to turn my desktop into a giant smart phone. NOT for me.Exactly. I have a handphone but Its mostly off and if its on its for SMS only. My updater tells me to install SP1 but it somehow doesnt even start downloading while all other updates downloaded just fine. Windows is just getting weirder and weirder. My fav version was W2000. Doesnt W8 have a Properties...Compatibility option when you rightclick on your Bryce program? Same here. I’m really not happy with the direction they’ve taken windows 8. I dont even own a smart phone because I hate all those stupid little applications, now windows wants me to turn my desktop into a giant smart phone. NOT for me. Windows 8 - is that yet another smart phone? No thanks! I’m not going to bang with the fist on the screen. It never helped. Mwahahahaha!!! Don't you know that Microsoft has decreed that you shall upgrade to Windows 8? Microsoft has spoken - You have no choice! MS will play the tune, and all of the software developers will dance... Eventually, you won't be able to find decent programs that will work in Vista/Win 7. This is as it has always been. MS is God. Resistance is futile. Are you using mouse (relative pointing mode) or absolute coordinates pointing device (pen tablet, touchscreen)? I've seen such an issue you're describing (also very quick response of sliders in DTE) when using touchscreen or pen tablet under win7. It's the thing about how mouse coordinates are used by the application i.e. many shooter games go crazy when played on the tablet because they expect relative pointing mode. The solution for them is either to slow down their response (a lot of shooter games have the mouse precision slider to slow down the response) or even easier - switch the pointing device mode to relative. I tried all the compatibility modes and they had no impact on the problem. I had the same thoughts recording relative and absolute mice/tablet configuration. Sad to say mouse (Logitech cordless) or tablet (Wacom) it made no difference at all! I am afraid that nothing can be done from the users standpoint. The application is non functional as it is. We will have to wait for an update from DAZ. Best is probably: DONT GET Windows 8. It seems to be some kind of play version, something for kids who dont know anything but their sillyphone. Windows 8 - is that yet another smart phone? No thanks! I’m not going to bang with the fist on the screen. It never helped. Mwahahahaha!!! Don't you know that Microsoft has decreed that you shall upgrade to Windows 8? Microsoft has spoken - You have no choice! MS will play the tune, and all of the software developers will dance... Eventually, you won't be able to find decent programs that will work in Vista/Win 7. This is as it has always been. MS is God. Resistance is only futile for people who behave like sheep and allow these corporate assholes to manipulate them. Take a look around you, there doesn't seem to be that many sheep in this thread. Hardly anyone wants the bull that is Windows 8. In this thread alone, including myself, at least five have made it clear they won't be buying this crap - and that's fantastic news! If you are buying, it is you they have dancing - not us - and it is you who will learn the hard way. That link is just an example (the tip of the iceberg) of how these assholes are taking liberties and manipulating their customers. Companies such as Apple, Facebook, Google, Microsoft and Twitter etc, all share a common interest and that interest is you. The answer to dealing with these manipulative corporate assholes is to avoid them altogether, it's that simple. Don't buy their products and don't use their services. There are better and cheaper alternatives out there anyway. Just go for a Linux-based OS, some of them even run Windows software faster than Windows does (which only goes to prove just how bad Windows performance must be). If that article on Facebook doesn't wake people up as to what's going on, nothing ever will. Windows 8 is nothing more than manipulative corporate arrogance, so don't buy it, install a Linux-based OS instead - for free. Which version of Linux will Bryce run on? I tend to disagree, back when Vista was released they tried to force it down everyone's throat by announcing they would be stopping support for XP. When people looked into Vista they found that it was loaded with issues not the least of which was incompatability issues with a great many 32 bit programs. So the customers got together, protested and forced Microsoft to keep going with support for XP until they could either fix all the issues with Vista or come out with a better OS that didn't have so many problems. Sure the giant smartphone approach that Windows 8 appears to be will likely catch the interest of a new generation that grew u with smart phones but fortunately that segment of the market is still a minority. This is no time for sarcasm, Peter, behave yourself. What would have been a more fitting reply would be to read the whole page at the link, and for you to point out that you'll show it to your friends, because believe me, anyone who has been anywhere near Facebook would be extremely thankful you pointed it out to them. Consider the poor souls that aren't aware of all this and will continue to use Facebook, I mean wow, imagine that! I'm just thankful I'm not gullible enough to have ever done either of those things, and hopefully you weren't either. But like I said, consider the unfortunate ones that actually use it, and do them all a favour, show them the link. As for actually running Bryce on a Linux distribution; I don't know, I haven't tried it. All I'm interested in is getting my latest software purchases to work on it, and for the most part it has been a success, shockingly good in fact. Not only that, but a lot of the software I use is available for Linux anyway (and more of it is coming soon). But let's just say Bryce won't work on Linux (remembering that it won't even work on Windows or Mac OS properly anyway). So what are you going to do, Peter, allow the likes of those assholes to data-mine you, just so that you can use Bryce? Rather you than me mate, because all you really have to do is keep a separate partition for Windows that is never allowed to connect to the internet. That way you can still use Bryce but use Linux for everything else. For those new to GNU/Linux systems, you might be pleased to know there is an official link managed by the FSF. They list the GNU/Linux distributions that meet the guidelines set out by the FSF, so be extra careful about using distributions that are not listed here. Most distributions make use of proprietary software meaning it can be used for manipulation and privacy invasion in the same way the commercial operating systems do. If in doubt about what GNU/Linux system to trust, see the link. I think we're mostly preachin to the choir here - most folks who use their computers a lot are more picky about how their computers work - we get used to the way our current OSs behave, find ways around all the aggravations, make things work the way we want, and MS comes out with a whole new desktop paradigm and we're all supposed to drop what we're doing and jump on the bandwagon. No matter that the new desktop is something that only an iPhone addict could love, and they get to data-mine us like there's no tomorrow... but yes - there are droves of "sheeple" who will do as they're told, and the market will be driven by them. Their new computers will all come loaded with Win 8, and most of them will simply leave it that way. As for Linux - Oh, if the world could be so perfect... I love Linux, and if it weren't for the fact that I write software and websites and 99% of my potential customers are Windows users, I would gladly tell MS "Adios!" and never look back. The problem with Linux is, it's not Windows. Most software on the market, and therefore most software that people use, is Windows software. Yes, Linux has come a LONG way since the old red-hat days. Yes, you can make MOST Windows software to run in Linux using Wine, virtual machines, etc., and most of what you can't run, you can find a comparable program for free. These are blessings for those of us who will go to the extra trouble to make things work in Linux. But most won't go to the extra trouble. If it takes more than an "installation wizard" to install something, they're not interested. Linux would have to be dumbed down and candy coated to appeal to the average consumer. Well it didn't just happen, the public made it happen. I see it continuing to happen if it hits us in the wallet because that's what really did it before, lots and lots of people unwilling to go out and buy all new 64 bit software when they had perfectly good 32 bit software they paid good money for that did everything they wanted/needed it to do except on Vista. Times are much much more tight now than they were back then. The one worrisome thing though is nothing I've heard about Win 8 suggests a consumer has to replace anything. All the criticisms seem to be cosmetic and this data mining issue and as bad as that sounds 99.9% of the people accessing the internet have been getting data mined for years. I kinda like your post, it shows some reasoning, but you're missing the whole point when you say things like "Our only hope for a palatable Windows experience in the future..."
Windows isn't our only hope, our only hope is Linux because it's open source and therefore can never be taken over by greedy, corrupt, manipulating corporations. Why do think there was all that stink years back over free software? It was because the greedy corporations didn't like it, because Linux is their worst nightmare, something they have no power over. Linux is there for the benefit of the people, not the benefit of corrupt corporations. That alone tells anyone with any sense what OS they need to use, and the sooner they start using it, the sooner they escape the dangerous data-mining and corruption of the commercial OS's. Only the openness of the GNU/Linux OS will protect us from the corporate corruption and liberty taking being practiced by the giant commercial corporations. Windows, no matter what they do to it, will never give you the peace of mind you have using Linux because it's in Microsoft's best interest to data-mine you whether you like it or not. You will never be free for as long as you use an OS developed by Apple or Microsoft, and the problem we face is making people understand that they do NOT need either of those operating systems. The fact is we do have the power to deal with the likes of Apple and Microsoft etc, and I for one have already done it. Now I use it most of the time, and in the future, all of the time. It was actually quite a painless transition (and a very satisfying one). I'm putting a firm finger up to those that deserve it, and most importantly of all, I'm supporting people and developers who fought massive battles to ensure we have the option of free software. Imagine if they hadn't succeeded, THEN you wouldn't have a choice. Be thankful that they did, and that we do! The problem is that people are afraid of change despite the fact that millions upon millions of people are using Linux all over the world. People need to be educated as to what underhand things are going on around them, and they need to be encouraged to use Linux. Linux is here to stay, it will outlast every other OS because it is open source and unstoppable, no one can kill it. The sooner people jump on that bandwagon, the sooner companies like Apple and Microsoft will pay the price. This Christmas, millions of people will offer themselves up to Apple and Microsoft like lambs to the slaughter. Even worse, they'll actually pay them for the privilege of doing so. You have to hand it to these corporate tossers, they might be corrupt, but boy do they know how to herd the sheep in - bulk style! Aye, and you'll be spending even more time fighting problems if/when some hack compromises Apple's database that is chock full of your life. If/when that happens, it is you that will be dealing with it, not Apple. That is why they made the disclaimer you was forced to agree to. They're quite prepared to put you in a situation you have no control over as soon as you agree to their terms. BTW, Dave, just in case you think I'm targeting Apple users, that is not so. As far as I can tell, Apple are actually the better behaved among these corporations. But just about all of us are a victims of this illegal corporate liberty-taking crap, and the thing is to learn from it when the facts are staring us in the face. I'm pretty sure that to ignore it would be the ultimate in stupidity. It's a shame Apple are what they are, and it's a shame Microsoft are what they are - but they are what they are.